It’s here, some people’s favorite weekend between Halloween and Thanksgiving –- the end of Daylight Saving Time. Remember to “fall back” this Sunday – most of our nation gets a bonus. This stock image depicts a man sleeping. But don’t make a common mistake: Turning that extra hour into an extra hour of sleep. We’ll explain, but first, the basics. November 4 at 2 a.m., most of the country will move from Daylight Saving Time (DST) to Standard Time (ST). Does this happen everywhere in the country? No. If you live in Hawaii, Guam, Puerto Rico, U.S. Virgin Islands, American Samoa and most of Arizona, your clocks will stay the same. For the rest of you –- enjoy your bonus hour. Why do I feel out of whack? Janet Kennedy, PhD., clinical psychologist and founder of NYC Sleep Doctor, says the best strategy is to switch to the new time right away — stick to the clock. Daylight Saving Time is just an hour. Can an hour really affect your sleep that much? “Absolutely — we are creatures of habit! Transitions to new schedules take time. Even a change of one hour can make a difference,” said Rebecca Robbins, Ph.D., co-author of “Sleep for Success,” and a post-doctoral research fellow at NYU School of Medicine. Her research identifies strategies for improving sleep and health. Shouldn’t I use this hour to catch up on much-needed rest? Probably not. The best example of this is “sleeping in,” the weekend temptation we all face without the need to rise early for work or school. It comes with the trap to “catch up” on sleep. But this is a myth, Robbins says. “If we delay our bed or rising time by even one hour our body goes into transition mode, trying to transition to a new time zone,” Robbins said. “The best way to recover from insufficient sleep is to keep your sleep schedule as consistent as possible. If you wake up at 6 a.m. during the workweek, you can sleep until perhaps 6:45 a.m. on the weekends but not much longer. I have little kids. They’re not gonna sleep an extra hour, are they? Children are acutely aware of changes to their sleep schedule. They will likely keep you honest and wake you up at their normal time! What this means for parents is that it will be important to resist the urge to stay up a bit later. Keep your regular bedtime, put the kids to bed at the regular time, and wake up at your regular time. Winter’s coming. It’s going to be darker when we wake up. How do we deal with that? “During winter months we have evidence that we sleep longer. In some ways, this could be viewed as hibernation of sorts,” Robbins said. “Without access to sunlight, our bodies have less ability to fully understand when it should be alert and when it should be tired. 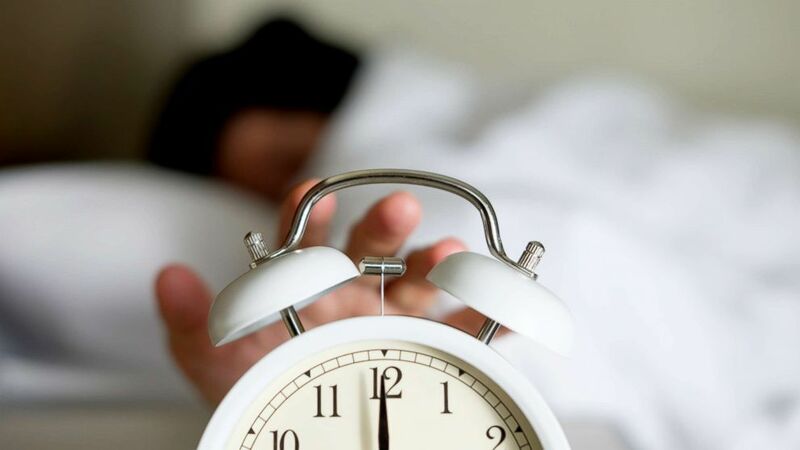 An alarm clock goes off in this stock photo. “To ensure your circadian rhythm remains intact, go outside when the sun is out as often as you are able, and optimally first thing in the morning. This will trigger the alert phase of your circadian rhythm, then an afternoon walk — even if it seems to be gray outside — will help your sleep and wake phases stay intact,” Robbins added. Look on the bright side, Robbins continued. What other sleep advice do you have about this annual event — setting our clocks back? Eric M. Strauss in the managing editor of the ABC News Medical Unit and welcomes you to share your sleep strategies at @ericMstrauss.